On February 4, Sri Lanka celebrates the 70th anniversary of Independence. This year also marks the 200 years of Uva - Wellassa Rebellion of 1818 which paved the way for future struggles to free ‘Ceylon’ from the clutches of the British Empire. Hence, to say that no blood was shed to win independence from the British Raj is far from the truth. Perusing the pages of Ceylon’s struggle to win independence from being a British colony, one could see well that we have failed to give credit where it is due. At the same time, we note that there is something lacking in showing our gratitude to the present generation of the ‘Wellassa people’ on our part as Sri Lankans. It is downright ungratefulness that we totally ignore the sacrifices our forefathers made to free the country ever since Ceylon became a colony, with the signing of the infamous “Upcountry Treaty” on March 2, 1815. It is also remarkable that Sri Lanka, ever since the day we won Independence, thanks to the 20th century generation, the new generation shows no gratitude to the Catholic/Christian contribution made to win Independence. But the history is full of stories of their contribution and bringing all citizens irrespective of their ethnicity and difference of faith and belief, to rally round to be a part of the Independence movement. The Movement for Independence, though political, was claimed to be a very peaceful one. This is because by nature, Sri Lankans are non- aggressive, but firm in their commitment for a cause they aspire and give leadership. 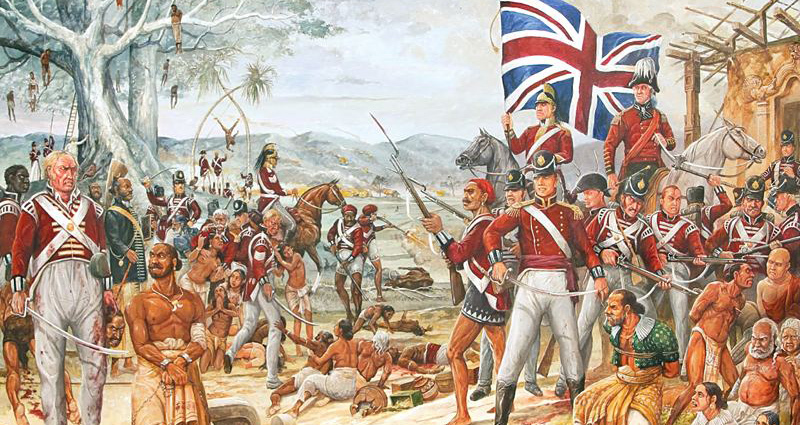 We were a colony under the British Empire for nearly 150 years with the signing of the Treaty on March 2, 1815. The influence of the militant struggle in India reflected well in the Sri Lankan soil and moved the less militant masses to join hands to fight for independence by convincing the British not by waging war but by impressive communication, exchange of ideas, acting with a clever brain and pragmatism. Some claim that although we won independence, we were a dominion of the British Empire/ Commonwealth until May 22, 1972, where we ended our dominion state and declared our country as the Republic of Sri Lanka. But one must not forget that we were able declare ourselves a Republic, because with Independence, we had the right to freedom of thought, freedom to choose our own government to rule and even to decide the future course of action. Therefore, we must not make the mistake of saying that the independence given, was for nothing. This is one way of demeaning the efforts made by that generation. The year 1915 incident moved the people with strong commitment to fight for freedom. The incident was the declaration and imposing of the brutal British law of shooting the Buddhist Sinhalese at site as if stray dogs. The initiative to protest against this barbaric law was taken by the Catholics/ Christians. There was a strong protest against that draconian law imposed here and expressing their strong views, they demanded a ‘Royal Commission’ to be set up to look into that incident. The proposal came along with the expressing of strong views by Edmund Joseph Samarawickrama, a lawyer by profession, against the British army. He was an ardent Catholic and was conscious and concerned about the way the British treated the Buddhists. But his name is hardly being heard. A person of his caliber, a man of fearless service to his country and fellowmen created the atmosphere for the emergence of future Lanka Jathika Sangamaya. Catholics of this country feel hurt that their contribution is hardly mentioned. Yet, those who are appreciative of the service and role played by the Catholics, bow their heads when they hear that the Catholics were the guiding stars and pioneers at the preliminary stages of the freedom struggle. Catholics of that period joined hands with others seeking no favours whatsoever but were moved by the sole purpose of bringing all to the forefront in fighting for Independence. There was an eye opening series published by the magazine ‘Doothya’ a Catholic publication, and thanks to Stephen Silva, unearthed the facts hidden to enlighten those ignorant. The others along with Samarawickrama included M. A. Arul Ananda, Edwin Wijerathne from Kegalle, Catholic historian John M. Senevirathne, and Edward Thimothy (E.T.) de Silva, the brother of M.C.de Silva Queens Counsel, who was the one and only Sri Lankan to have held a post in the Privy Council. E.T.De Silva was honoured by Ponnambalam Ramanadan and called de Silva, the Brilliant Star of the political sky of Ceylon. He was also responsible of publishing ‘Janathaava’ magazine to educate and awaken those in slumber. Undoubtedly, he remains a shining example to those keen to serve the masses. Sir James Peiris, James de Silva Wijerathne, E.W. Perera, Dr. S.C.de S. Wijerathne, C.J.C. de Silva, Dr. A W. P. Jayatilleke, W.W. Joseph Fernando , Lionel de Silva and Dr Lionel de Fonseka are among those Catholics and Christians who did much to win Independence.